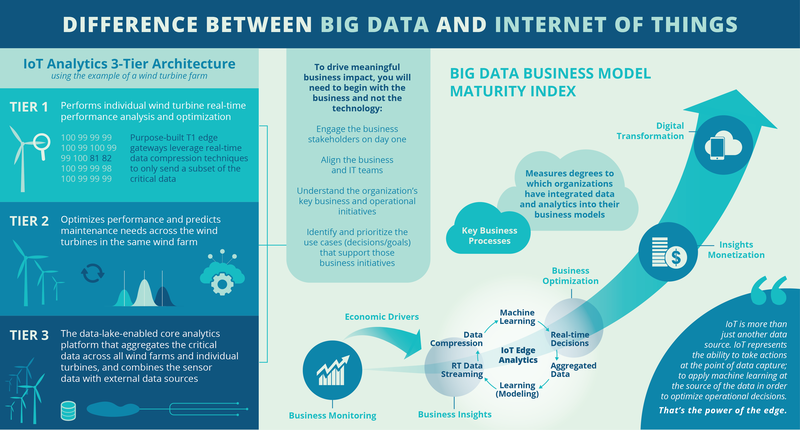 What is the Role of Big Data Analytics in the Internet of Things (IoT)? We can connect all the things to the cloud database & find the pattern. A voluminous amount of data have been produced since the advent of the Internet of things (IoT) devices. Data are not useful without analytics. Numerous solutions have enabled to obtain insight into large data generated by the devices. These solutions still in infancy as the domain lacks proper definition. IoT data analytics is definitely a future happening. Different types of analytics are used according to the requirements of IoT applications and divided into real-time, off-line, memory-level, business intelligence (BI) level, and massive level analytics categories. Sensors send gigabytes of data in an hour. The real challenge is to store, manage and derive value from these sensors data. Big data technologies will help in storing the unstructured data, process it and deduce insights valuable for business purposes. IoT implementation goal is to increase revenue, improve productivity, efficiency & the lower cost to businesses. All these can be achieved only if there is a proper strategy to harness value out of the data it generates. Real-time analytics is typically performed on data collected from sensors. SAP Hana is an example of real-time analytics architecture. Off-line analytics is used when a quick response is not required. Hadoop-based off-line analytics architecture reduces the cost of data format conversion and improves data acquisition efficiency. Kafka is an example of architectures that conduct off-line analytics and can satisfy the demands of data acquisition. Memory-level analytics is used when the size of data is smaller than the memory of a cluster. The memory of clusters now has reached terabyte (TB). MongoDB is an example of software used this architecture. BI analytics is used when the size of data is larger than the memory level, but data may be imported to the BI analysis environment. BI analytics can help to discover strategic business opportunities. Massive analytics is used when the size of data is greater than the capacity of the BI analysis product and traditional databases. Massive analytics uses the Hadoop distributed file system for data storage and map/reduce for data analysis. There are several types of data analytics which can be used in the IoT investments to gain advantages as described below. Streaming Analytics: Real-time data streams are analyzed in this process. Spatial Analytics: Used to analyze geographic patterns to determine the spatial relationship between the physical objects. Time Series Analytics: Used for time-based data which is analyzed to reveal associated trends and patterns. Prescriptive Analysis: It is applied to understand the best steps of action which can be taken in a particular situation. Big data analytics is emerging as a key IoT initiative. One of the most important features of IoT is its analysis of information about connected things. Big data analytics in IoT demands to process a huge amount of data and store the data in the storage. This allows organizations to gain rapid insights, make quick decisions, and interact with people with devices. The need to adopt big data in IoT applications already been recognized in the fields of IT and business. Although, the development is lagging, these technologies are inter-dependent and mayd be jointly developed in future. For example, the interaction of devices such as security cameras, smart traffic lights, and smart home devices, generates large amounts of data sources with different formats. This data can be stored in low cost commodity storage as shared distributed fault-tolerant databases. The step applies analytics tools such as MapReduce, Spark, Splunk, and Skytree that can analyze the stored big IoT data sets. Big data is simply about data and IoT is about devices, data, and the connectivity. More and more people are getting online and with the increase in number of digital citizens, deluge of data is produced every second. Big data helps in managing and deriving value out of this data. This Article Has Been Shared 602 Times! Cite this article as: Abhishek Ghosh, "Big Data Analytics in Internet of Things (IoT)," in The Customize Windows, March 19, 2019, April 18, 2019, https://thecustomizewindows.com/2019/03/big-data-analytics-in-internet-of-things-iot/.